Are Any Stars Poised for Offseason Hardware? The votes are starting to pile in for the end-of-season awards given out in Las Vegas. Jamie Benn took it upon himself to steal an award last season with his four-point performance in the final game of the regular season, earning him an Art Ross trophy. As of this writing, Benn is 12 points back of Patrick Kane to repeat his Art Ross victory, something that looks a bit out of reach at this point in time. I think Benn will gladly trade last season’s situation for the one he is in now, however. Instead of fighting for an Art Ross, Benn and the Dallas Stars will be fighting for a Stanley Cup this spring. While they would love to bring that trophy home, are any individual trophies on the horizon for any Dallas Stars? This is going to be a tough one to bring home as long as both Benn and Tyler Seguin are playing alongside one another. They both play so well throughout the course of a season that they will almost certainly steal votes from each other, leaving the award for another player to swoop in and take control. Benn’s higher point total should keep him in the running this season, especially if he is able to make a run like the did late last-season. If you’ve watched the Stars closely this season, you would likely make the argument that neither Benn nor Seguin have been the most valuable player in Dallas this year. And you would not be wrong. 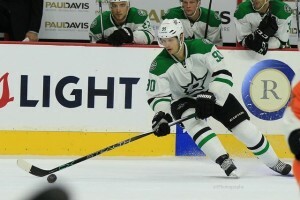 Jason Spezza has been superb this season and it hasn’t been all about points for him. Since coming to Dallas, he has made a point to improve his play away from the puck and it shows. He’s one of the best Stars at taking the puck away, with 36 takeaways at even-strength this season (good for third on the team). He has cut down on his giveaways as well, with just 39 at even-strength this season. Spezza had 55 giveaways to 46 takeaways last season. He won’t be in the running for the Hart Trophy, but he might be the most valuable Star this season. Will Benn or Seguin have a shot? Probably not, considering what else has gone on around the league. Kane is a lock to at least be a finalist. Erik Karlsson deserves a ton of love for what he is doing this season. There are at least three goalies who could be in the mix (Lundqvist, Holtby, Schneider). There have been some incredible individual performances this season. Benn has the best chance to be a finalist but barring an incredible late-season run, don’t expect him to bring home the Hart. Erik Karlsson should already have his name etched in this trophy so this will be a discussion about if a Dallas Star can finish second or third. John Klingberg, up until his injury, was in the discussion. His play in his own end has been suspect at times but it seems as though people around the NHL are finally starting to accept that strong offense and possession is just as useful for a defenseman as their play in the defensive zone. Certainly he isn’t Karlsson-level, but what Klingberg has done this season cannot be overlooked. 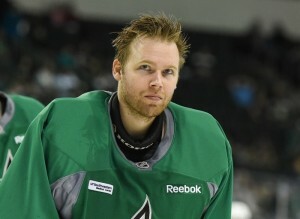 He is the best or one of the best Dallas Stars players in every meaningful possession statistic there is. His 26 points during 5-on-5 is only bested by the trio of Benn, Seguin and Spezza. He’s added 18 more points on the power play this season as well, also fourth on the team. His point totals and general dominance when he is on the ice will allow Klingberg to fight to be a finalist for the Norris this season. He’s only going to get better, look for him to have his name on that trophy at some point in his career. No Dallas Star will likely even get a vote for this award. If I were to award any votes in this category to a Star, it would be Mattias Janmark. I’ll talk more about him a little later, but he has been the best two-way forward for Dallas this season. His “hockey-IQ” is off the charts for a rookie and is looking like yet another steal-of-a-trade for general manager Jim Nill. Can somebody please toss just one vote to Kari Lehtonen for taking a Shea Weber bomb to the worst area imaginable? In all seriousness, no Dallas Star is touching this award. Goalies that have been sent back down to the AHL have a better chance at getting votes for this than either Lehtonen or Antti Niemi. Move along folks, nothing to see here. In seasons where the rookie class isn’t as deep, Janmark may have had a shot to be a finalist for this award. However, this season has seen one of the deepest rookie classes we’ve seen in a long time so Janmark isn’t coming close to finishing in the top-three. He’s been incredible though and could steal a few votes away for his play in his own-end and the excellent transition-hockey he has played this season. Janmark has racked up 24 points during 5-on-5 play this season, good for seventh on the Stars. His 11 even-strength tallies put him just one 5-on-5 goal behind Sharp and Benn. 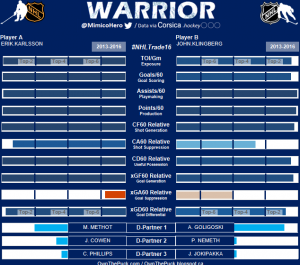 If he was able to cash-in on more of his chances, he might be further up in the Calder debate. He has more high-danger-scoring-chances at even strength than both Connor McDavid and Artemi Panarin, although McDavid has played significantly fewer games. In any other season Janmark would be hanging around the discussion but there are just too many good rookies this season. He might snag a few votes, but don’t expect to see him as a finalist. Here is one that a Star could realistically bring home in the offseason. 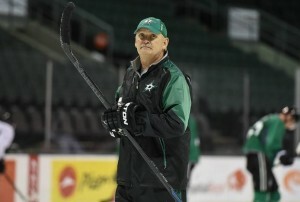 Lindy Ruff has been a master of line-“Ruffling” this season to provoke big comebacks from his team. Although he has done it almost to a fault, the line juggling has worked more often than not this season. It might seem easy for Ruff to just throw together lines as he is working with one of the best offensive-rosters in the NHL, but a lot goes in to what he does for each game. When working with this much offensive talent, it can be tough to make sure everyone is getting what they need to succeed. For the most part, Ruff has been excellent at getting the most offense out of his stacked line-up. One thing Ruff has done that he doesn’t get much credit for is manage the minutes of his players. He knows what the goal is for the Dallas Stars this season. Benn is the only forward averaging over 20 minutes of ice-time per game this season. The defensemen-minutes have been spread around effectively, although injuries have forced some changes as of late. With the addition of Kris Russell and a healthy Klinberg and Demers, the Stars would really be able to spread their defensive minutes. Only one forward on the team has averaged less than 11 minutes of ice-time per game and that is Travis Moen, who has only appeared in 20 games this season. Barry Trotz will be in this discussion. Joel Quenneville is as well. I’ve heard a lot of talk about Bruce Boudreau for Anaheim’s turn-around although that feels like rewarding Superman for saving a bus full of people after he was the one to throw it off the cliff in the first place. Ruff will be mixed up with those three and some outliers. If Dallas is able to capture the Central Division by the end of the season, he will get plenty of votes for the Jack Adams. As for some of the lesser-talked-about awards, there won’t be much discussion around the Stars. Jim Nill should be talked about more for his work as general manager when looking at the trades that brought Patrick Sharp, Stephen Johns and Mattias Janmark to Dallas. However the decision to sign Niemi long-term and the price he paid for Russell may keep him out of the top-three. No Star will be a threat for the Lady Byng trophy as every Dallas player with a significant amount of points has taken enough penalties to keep them away from that award. As for the Bill Masterton Memorial Trophy, which goes to the player who best exemplifies perseverance, sportsmanship, and dedication, I’m not sure who will be the Stars’ nominee. Perhaps Patrik Nemeth, who came within centimeters of losing his career last season due to a skate-blade-cut on his arm. This award will almost certainly not go to a Dallas Star this season. The Stars’ best chances at offseason awards will likely be Ruff and Benn. Benn would have to go on an absolute tear in the final few weeks of the season for the Hart and one has to think the Stars need to win the Western Conference (in the regular season) for Ruff to have a shot at the Jack Adams. We’ll see if they have it in them.